The Coomon Cuckoo's "koo-koo" is a well-known sound for most of the people. It can be heard from May and early summer, when it has returned from spending the winter in Africa. The appearance reminds a small bird of prey, with its pointed wings, long tail and fine black lines on the abdomen. This species is found in many different biotopes. The Cuckoo does not build nests itself, but "parasitizes" other nests from different species by laying eggs in their nests. 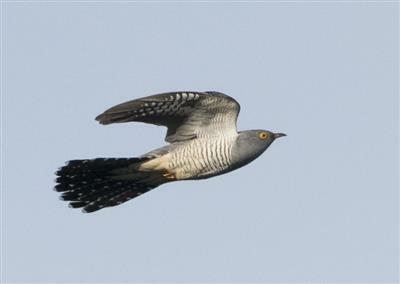 A Cuckoo chick is therefore always raised by "host" birds of other species. Medow Pipit and Reed Warbler are examples of two common host species.